Last night, June 25th, the final of the Club Doubles Championship was played between reigning title holders Mike Happell/Bret Richardson and Kieren Booth/Daniel Williams. Despite it being nasty night outside, a good crowd gathered to watch what unfolded as an excellent exhibition for all concerned. Whilst it was no surprise that Mike and Bret were able to defend their title, Kieren showed that his comeback to the game is going at full steam and Dan, whose handicap is some 10+ handicap points higher than the others, looked like he belonged in the said company as he made almost every volley that came his way and defended the Grill and Tambour with courage and skill. Despite Kieren and Dan’s best efforts it was Mike and Bret who carried the day, or evening, and they remain the premier doubles combination in both the Club and country. P.S. Barbara’s sausage rolls were a real treat and thankyou to Lizzie Brown and Fiona Hewson for your efforts on the night. On Monday 14th June we celebrated Queen Elizabeth II 84th birthday (actual birthday April 21) by playing round-robin handicap doubles. Good tennis interspersed by an Andrew Schnaider inspired lunch led to a jovial crowd staying on after their own tournaments were over to watch the finalists. It was fitting that the English pair of Nick Brodie and Steve Wood took out the event and it also marked the last time we shall see Nick Brodie for the time being as he has to go back to England. On behalf of the RMTC, Nick, bon voyage and we hope to see you back here as soon as possible. What better way to celebrate Bastille Day than to hear about these two tennis courts in southern France? The court in Suze is defunct, but the one in Pau, modelled on the courts in the Jardin des Tuileries in Paris, may yet free itself from trinquet, and be restored to a proper real tennis court – the members of the Cercle du jeu de paume de Navarre are quietly confident! The talk will be from 6.30 pm to 7.30 pm in the committee room, and will be followed by dinner for those who wish to stay on to celebrate le quatorze juillet. Please place your name on the signup sheet in the club. Lancashire (Lesley O’Byrne, Stephanie Williams, Barry Johnson) defeated Hampshire (Lee Pessall, Fiona Hewson, Michelle O’Rorke). Hotham (Sarah Vigrass, Jonathan Buckley) defeated Mt Buller (Walter Cockram, Nick Brodie). James Gould, Owen Guest, John Moran and Carla Story. Last Friday night the RMTC was seen at its finest when 70 odd enjoyed a Pasta Night and then kicked on into the night singing with Tony Bafunno. The mood was relaxed and enticing enough that Jon Hamer could be seen holding up the bar and singing tunes from about 10PM until 1AM. Others occasionally got a look in, Andrew Schnaider made Edith Piaf proud, Owen Guest found out he is no John-Paul Young and Paul Andrews belted out any tune that came into his head. New talent was unearthed in the hefty form of Will Fowles whose version of Mustang Sally early in the night, along with a few Joe Cocker dance moves, got everyone going. Later in the evening James and Georgie Gould sang a duet to much applause. And throughout all of this interference Tony Bafunno managed to keep playing all night long – as long as Tony sings the Beatles shall never die. Well done and thankyou to Andrew Schnaider, Lizzie Brown, Michael Petruccelli, Frank Filippelli and Tony Bafunno for making such a special night. On Friday morning last (21 May) 11 of the Empire’s finest met to play a little tennis, dine upon Salmon, eggs and toast and to reminisce about great battles past. Jonathan Sear made it a great morning by cooking a breakfast that would have had Napoleon consider changing sides. On the tennis front Ross Weber came fifth narrowly edging out Julia Page (who came either 4th or 6th) for a bottle of the Old Empires finest Gin (Bombay Sapphire). The tennis played was enjoyed by all and yet strangely difficult to describe. Thankyou to Jonathan Sear for organising the morning. One of the club’s most popular events, the Exhibition Street Cup, took place over the 15-16 May weekend. Try as our wonderful handicap system does, there were a few familiar names doing well. Out of the original 30 players Michael Williams and James Gould both showed that they are still improving. James Gould was the tournaments early favourite defeating Chris Chapman, Frank Filippelli and his father along the way before losing unexpectedly to newcomer Harry Swinnerton in the semi-final. Nick Shelton also fancied his chances before succumbing once again to Sarah Vigrass in a quarter-final. David Johnston, another new player from RSY, continues to show great promise by making it to the quarter-final stage. The final was played between Michael Williams (H’cap 23) and Harry Swinnerton (58). Harry, playing in his first tournament, pushed Michael all the way by bowling down railroads and playing an all around robust game. Close as the final was, it was Michael’s experience and polish, along with a bit of brute force, that carried him home winning 8/7. 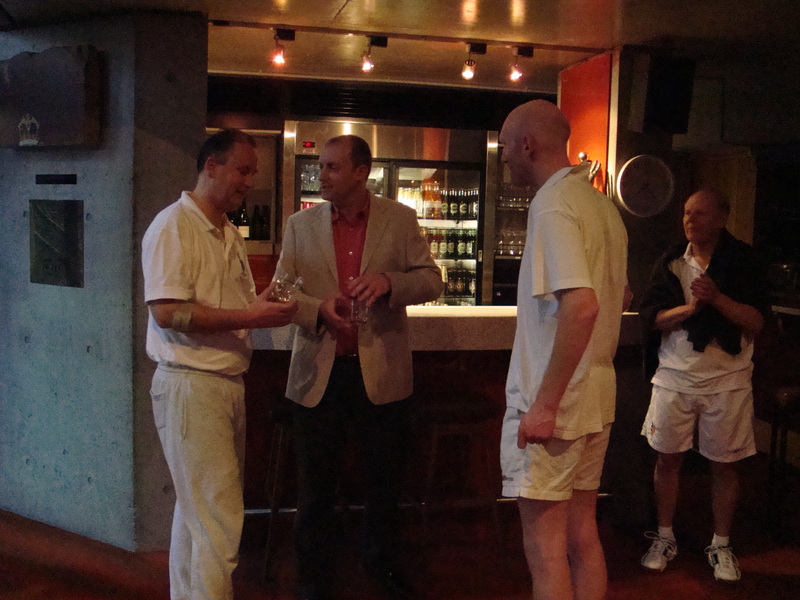 The Sunday doubles was also a close and enjoyable competition. Chapman and Brodie were on paper the most likely pairing to take the trophy home but they were no match for the experience of James Guest and Tony Miach, losing 7/8 in a semi-final. On the other side of the draw Ruaraidh Gunn partnering John Link made it through to the final with John playing an exceptional game from beneath the net. Guest and Miach won the final 8/7 and their names will now be placed upon the honour board which can be seen from the mezzanine. For the benefit of those who weren’t there, the RMTC’s annual general meeting took place on Wednesday 12 May 2010. Following the standard procedures, which were uneventful compared to the last couple of years, trophies for the club’s longstanding events were presented – some pictures are included below. During the meeting Andrew Buckle, Mike Happell, Natasha Heughan, Rob Kininmonth and Mike Wooldridge were elected to the committee. As of the AGM the RMTC’s committee is Owen Guest (President), Jon Hamer (Vice President), Richard Simpson (Hon. Secretary), Iain Buchanan (Hon. Treasurer), Philip Barker, Andrew Buckle, Mike Happell, Natasha Heughan, Rob Kininmonth and Michael Wooldridge.